We have available spacious room (maximum of 4 person) for female bedspacers looking for a comfy, clean, and convenient place to live in while studying or working @ Dr. A Santos Ave., Sucat Paranaque! Including Electric, Fans, Big Drawers, Water, Sound system, use of Laptop and free 24h WIFI access, as well as landline too. Well maintained and ventilated. Enjoy the benefit of a peaceful and secured environment, inside an exclusive building/compound - Located right beside UNIVERSAL COLLEGE and walking distance to Olivarez College / Hospital, STI, PATTS, also near to Shopwise, Puregold, Lianas, 7 Eleven, McDonald, SM Sucat and 5 min drive to NAIA airport. - Unit comes furnished and most of all ultra huge lobby/living room/dining room available. Not to forget the large bathroom. No curfew, every bedspacer has their own keys! One (1) month Advance and One (1) month Deposit required. For each Bedspacer PHP 1,995 per month only! For inquiries, contact us at (0928) 6509947, or you can just check out these luxurious place to see for yourself, but kindly call or text first for an appointment. Thank you! You searched for 3rd Flr. Guzmar Bldg. 8178 Dr. A Santos Ave. Sucat, Paranaque and this page shows the full details of this accommodation to let. 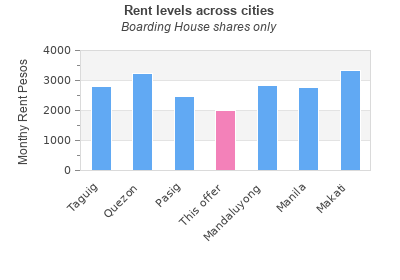 This Boarding House is located in San Dionisio in Paranaque. This property has bedrooms, bathrooms and the rent is PHP 2000 monthly. This accommodation for rent was last updated on 2010-05-20 14:36:07. The classified has been displayed 6840 only today. 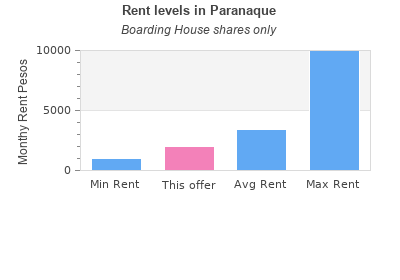 You can see other lettings in Paranaque.